I came back home from the 46th Annual Yuma Prison Run early this evening after a weekend of fun hanging out with friends. The Yuma Prison Run is a popular rally among the motorcycle clubs in Southern California, Southern Nevada and Arizona. It's organized by the Norwalk Motorcycle Club and benefits a host of children's charities, mainly dealing with burn victims. 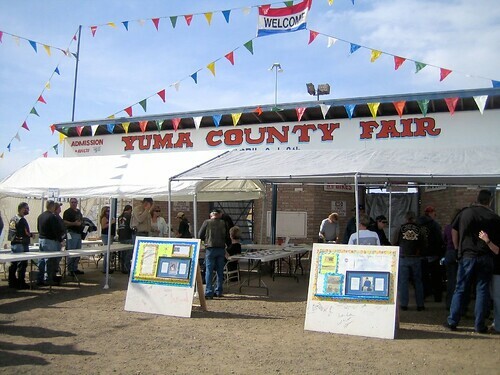 The name Yuma Prison Run come from the parade of motorcycles that runs from the Yuma County Fairgrounds to the old Territorial Prison in downtown Yuma. Some 3,000 to 4,000 bikes were expected to participate in the parade. I rode in it last year, but didn't do it this year. I'd guess that about 25% of the total people registered for the Yuma Prison Run actually rode in the parade. The other 75% partied on. Friday evening a storm blew in. Some people said that winds blew as much as 70mph. Dust and debris flew everywhere, some rain fell, and some tents collapsed. But Saturday was beautiful, with temps in the mid-80s and bright blue sunshine. I didn't watch any of the biker games nor the acrobatics of the Victor McLaglen Motor Corps like I did last year. I did, however, spend some time in the downtown area of Yuma. Lutes Casino is a cool place to hang out in. It was supposedly a casino in its early days, but now is a bar and grill. There wasn't much shopping taking place downtown this weekend, but it was filled with bars and bikes. Saturday night the fairgrounds was filled to capacity as the band played, bikers danced, and the Norwalk Motorcycle Club announced its tally of money raised for charity. The ride back to California along Interstate 8 was exceptionally pleasant, considering that stretch of road between Yuma and Ocotillo is known for strong gusts of blowing sand. After arriving home, I slept until I wrote this.